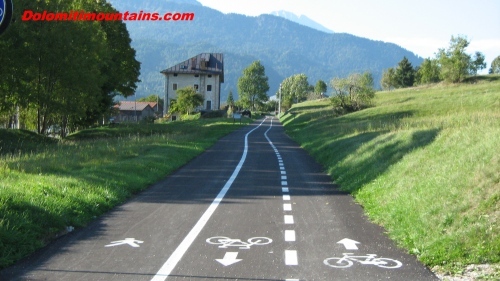 Cycling Dolomites today is The Cycle Track of the Dolomites, also known as The Long Road of the Dolomites, is a cycle path also for walkers. It is something more than a sustainable transport, it is a different way to enjoy the mountains. The track offers the possibility of cycling and hiking under the bulk of some of the most beautiful Dolomite peaks, such as Pelmo and Antelao. Ride through woods and meadows, passing within countries more or less known. The cycle track runs along an old narrow-gauge railway discharged in the early sixties. 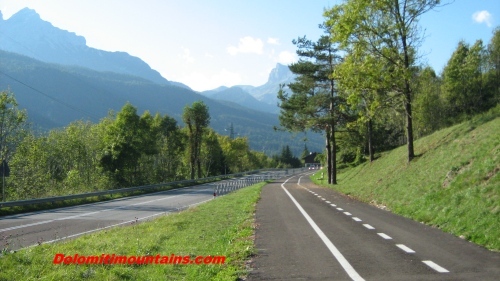 The cycle lane started from Calalzo di Cadore in the direction of Cortina d'Ampezzo, passing along the Boite Valley. From Cortina it goes towards the railway Dobbiaco, Alto Adige. Currently, the track goes to San Candido and, along the river Drava, reaches the Austrian town of Lienz. In the area bike maps are available. 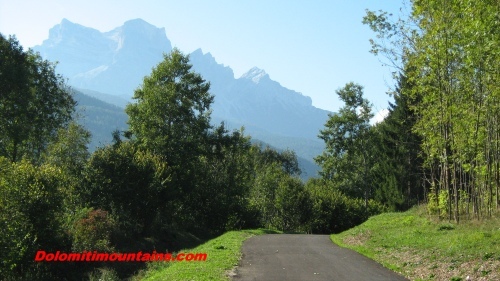 Over the years the route has been adapted to bicycle journey: it has been paved almost everything except some stretches towards Dobbiaco outside the town of Cortina. Underpasses have been created at the junction of roads that have high summer traffic flow, as the exit of San Vito in the direction of Cortina. The old railway tunnels, sometimes long and wet, were lit and secured. Upon booking you can load your bike on the bus that will take hikers to the station in Cortina, 2.50 euro price for the bike. Although not always respecting the original route of the old railway, the distances between the locations remain the same. From Calalzo to Cortina the distance is about 35 kilometres with a vertical drop of about 730 meters. This is a slight rise on average by 1.2% gradient, stretches of flat road are alternated to short tears. A sign at the entrance up area of Cortina promotes cycle track as a way back and down towards Calalzo with an average gradient of 2%. Towards Dobbiaco the dirt road begins. Ride of the feet of Pomagagnon to peack Fiammes and continue for a total of about 30 kilometres through the woods along the state route at times. Overall, the path is not always easy, is considered of medium difficulty, not recommended for children. Since summer 2015 a new branch of the cyclin dolomites path branches off on the main axis. Along the route of the old road from Pieve di Cadore down to Belluno it is now used as a path that partially follows the bed of the Piave river on a track dedicated to bikes. The new section is 24 km long and ends at Spar. Only during the summer there is a shuttle back to Calalzo, it is a passenger car designed to carry bicycles. From Dobbiaco to San Candido there’s a short jump, in a few kilometres you will reach the top of the stretch down to Lienz. Here the path is always paved, sometimes happens to cross paths taken by cars, sometimes railway level crossings. You move left and right of the Drava River, through towns like Silian where there are refreshment and equipped assistance much more than in the Italian section. Here pedestrians are not allowed on the trail. The distance amounts to 42 kilometres with an average slope of about 1.2% , about 500 meters uphill. Cycling dolomites is easy and suitable for the whole family. It’s pretty well signposted and very regularly viable. Also in Lienz is expected to return back, this time by train, not by buses yet, ticket price 8.50 euro per person and bike. This dolomiti mountain bike track is increasingly travelled in all directions by numerous groups or families. Many prefer cycling only some parts and run through the entire path on several occasions. It is always an emotion cycling dolomites.